The Wirehaired Pointing Griffon is a medium sized dog with a harsh, wiry double coat and distinctive facial furnishings. It is particularly adapted for swampy country, where its harsh coat provides excellent protection. 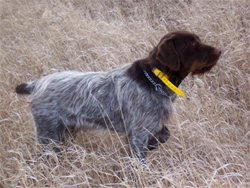 A versatile gun dog with a high degree of trainability, the Wirehaired Pointing Griffon excels in hunting upland birds, waterfowl and small game. It is a deliberate, thorough and tireless worker with a strong desire to please its master. The Wirehaired Pointing Griffon is a superb swimmer and retriever and it loves to play in the water. The ideal Griffon household is one where its owners are active and include their dog in their daily routines. This highly active breed requires daily rigorous exercise to keep it mentally and physically fit. A good 60-90 minutes of activity per day will keep your Griff from getting bored especially if you vary the activity. 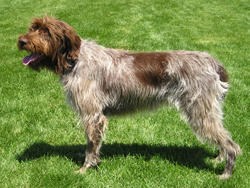 Additional breed information for the Wirehaired Pointing Griffon can be found at the American Kennel Club website.